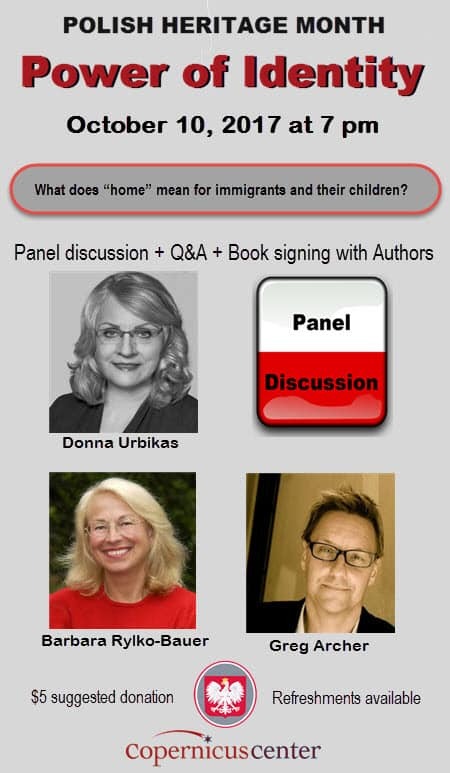 Panel Discussion: What does “home” mean for immigrants and their children? More than 75 years after Hitler and Stalin divided Poland and millions of her citizens were thrust into questionable fates, three award-winning authors converge at the Copernicus Center to honor POLISH HERITAGE MONTH. In a candid panel discussion, learn more about wartime Poland, the underreported chapters in Polish history, and the ripple effects of ALL war and how it shapes the concepts of home, place and identity for so many individuals. Discover how hope, faith, and resilience become an integral part of any odyssey. Following an introductory presentation, Moderator/author Greg Archer (Grace Revealed), leads and joins authors Donna Urbikas, and Barbara Rylko-Bauer in revealing discussions about the panel’s books, all of which have been hailed for their insights into the immigrant experience. In My Sister’s Mother, Urbikas recounts her Polish-born mother and half-sister’s survival as slave laborers in Siberia, and shares her own struggles attempting to create a similar bond the two women shared with each other as a result of their war-time experience. Rylko-Bauer’s revealing work, A Polish Doctor in the Nazi Camps, boldly chronicles her physician mother, who was seized as a political prisoner and forced to work as a doctor in the sprawling network of concentration camps. In Grace Revealed, Archer is haunted by tales of his Polish family’s refugee experience surviving Stalin’s reign of terror. His spiritual quest unravels a mind-bending odyssey and the risks his homeless grandmother had to take in an effort to keep her six children and husband alive. In this one-of-a-kind Polish Heritage Month event, the authors offer something unique for anyone interested in history, family origin and the themes of “home” and identity. After an audience Q&A, the authors will be available for a meet-and-greet, and to sign their books or answer additional questions. Refreshments will be available.